We are back at Palmerston tomorrow as we welcome Dunfermline in the Championship. In the one previous meeting between the two sides earlier this season, Josh Todd scored the only goal of the game to give us a great win at East End Park. 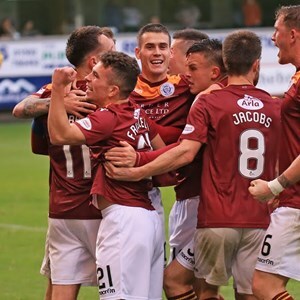 Buoyant from our point against Ross County away last weekend, the players and Manager, Gary Naysmith are looking forward to the visit of Allan Johnston’s side. Gary told the Club website “First off, a big thanks to all of you who travelled to the Highlands last weekend. I am glad that we got a good result. I was delighted to go to Ross County and get a share of the spoils – I would rate it as one of our best results of the season. Indeed, I said afterwards that it was the best I have felt after a game that we hadn’t won. The players deserve a lot of credit for the way they responded to going a goal behind. We had a wee bit of good luck when they hit the woodwork just before half-time and I told the players not waste the good fortune. There wasn’t much in the game in the opening 45 minutes but I felt that we needed to use the ball a bit better. We improved our possession in the second half and that’s games against the top two teams in the division that we have taken points from recently. The effort and the commitment from the players was tremendous and to be in the top four in December is excellent and everyone deserves praise for it. I was pleased that Andy came off the bench to get the equalising goal. It’s what you want your substitute to do. He wasn’t happy at not starting, and nor would I want him to be, but he made his point in the best possible way. Onto this week and like ourselves, Dunfermline will have an eye on that fourth spot and they will be looking to bounce back after last week’s disappointing result at Partick. Ironically, we’ve tended to do better away to Dunfermline than we have at Palmerston, so we know it’ll be another tough game. It’s the last time we will see David Norman in a Queens shirt as he is due to fly back to Vancouver. Stephen Dobbie and Gary Harkins are still missing through hamstring injuries and Darren Brownlie continues his rehab but everyone else is available for selection”. Dunfermline fans should note that sections six of the BDS Digital (East) Stand has been set aside for Pars supporters. Turnstile three will be in use for them to gain entry. The away end catering outlet and toilets in the BDS stand will be available for use. Catering is also available in the Arena café where a full menu is available before kick-off. The bar under the Gates Stand will also be open for refreshments. Entry to the game is by ticket only. The Arena ticket office will be open for both sets of supporters from around noon, with the BDS Stand ticket offices opening approximately and hour and a half before kick-off. Wheelchair access for away supporters is on the south side of BDS Digital stand. There is a lay-by on King Street for vehicles to drop their passengers for flat access to the ground. Disabled parking is available on the north side of the BDS Digital Stand or at the Arena car park. One personal assistant is included in the price of the accessible ticket. There will be on street parking restrictions around the ground, car parking is available in the Arena car park, alternatively there is plenty of other on & off street parking available away from the stadium. We aren't aware of any road works around Dumfries that would affect travel times to Palmerston Park however fans should check the Traffic Scotland website at http://trafficscotland.org/index.aspx> for confirmation and of any other delays. There is a yellow be aware weather warning for snow and ice – drivers should allow extra time for their journey. All spectators are required to abide by our policy on unacceptable behaviour. Our great value for kids, Saturday Club will take place at the Arena from half past 12. Primary School kids are invited to come along and enjoy two hours of fun and games before having some lunch and heading over to watch the first team game. All for £10 per child or £8 for Junior Blue season ticket holders. Kick off at Palmerston - 3pm.